After getting a glimpse of a rather splendid hydrogen fuelled train, the Oilholic next had the pleasure of being driven in a hydrogen powered electric fuel cell Toyota model - The Mirai - overnight from Salzgitter to Hamburg, Germany. Of course, much of the drive had to do with a demonstration of the fuel medium's prowess, the car's performance (come rain or shine of which we had plenty of), and more. We'll touch on that in the next post. But for now one question well worth asking is – for such vehicles to reach critical mass and wider public acceptance, retail points for filling up them up and keeping them running would be needed; so how is that problem going to be addressed? Afterall Toyota has an ambition of putting 1 million emissions free vehicles on the road per year between 2020 and 2030, and rivals such as Hyundai and Audi have plans of their own. Enter oil giant Royal Dutch Shell - which says the fuel retail industry has the answers. Speaking to this blogger at Shell Germany's Hamburg hub, regional Chairman Stijn van Els opined that the new "Hydrogen Economy" will indeed require a rethinking of the retail infrastructure but that's "well within the industry's scope" given that major oil and gas companies are already well on their way to exploring the alternative fuels market. "There is no competition with fossil fuels, there is co-existence as we move to a low carbon economy and Shell is committed to expanding its hydrogen fuel sales points. Furthermore, its not a shift we are attempting on our own." 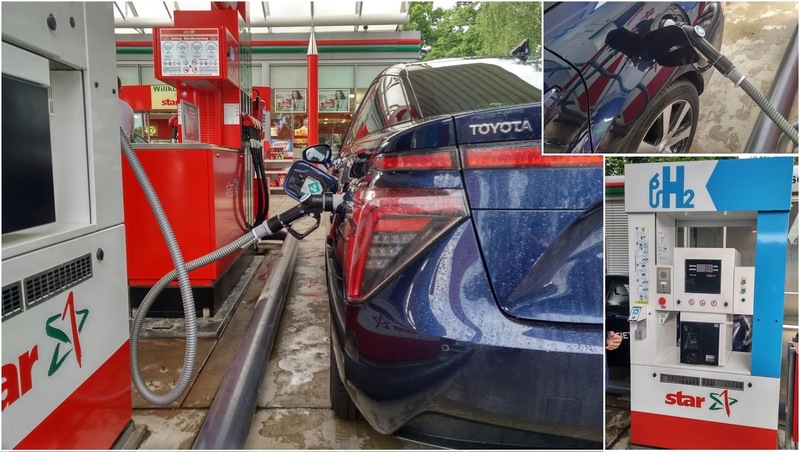 Survey data compiled at the end of 2017 suggests Toyota's home turf – Japan – has the largest number of hydrogen fuelling stations worldwide at 91, followed by the US (61), Germany (37) and the UK (18). The German figure is already above 40, at the time of writing this post, according to van Els, and the industry veteran hopes that at a pan-European level they'll be 400 sales points by 2019. Fuel retailers are expected to step up to the challenge for both retail and commercial clients over the coming decade, according to Toyota, with the automaker claiming "a hydrogen facility can be integrated into an existing refuelling station as an additional fuel offering." There is certainly evidence of that. For instance, Shell's FTSE 100 rival BP is already attempting this with electric vehicle charge points, at conventional gas stations, the most recent example being its downstream venture in Mexico. The Oilholic was given a demonstration of a fuel point setting with the Mirai en route to Hamburg via a refuelling stop at a station in Wolfsburg (See below right, click to enlarge). Filling up a hydrogen car was not any different from a petrol or diesel car, nor did the "pump" look all that different, even if it was pumping in compressed hydrogen instead of a petroleum product. Of course, when the hydrogen flows into the tank there's a chilling effect on the pump handle, unlike petrol or diesel refuelling where, well, you simply hear the liquid gurgling. It's all done in a matter of minutes, and instead of paying per litre or gallon, you pay per kilogram which is on average €9.50 in Germany, €11.50 in France, and around a same-ish post-Brexit £10 in the UK. Roughly around 5kg would constitute a tank-full equating to around 60 litres, according to a Toyota spokesperson. You do the math, but the Oilholic would leave the fuel economy firmly parked for now, and touch on it in a blog post to follow. So going back to van Els, Shell reckons hydrogen would "certainly" play its part in the alternative fuels market and so do the oil major's fuel retail rivals. And much of the industry, including world's top 20 fuel retailers have also said they are not averse to establishing hydrogen refuelling stations as greenfield sites as well. So it all depends on consumer take-up, but the "commitment is there", according to both Toyota and Shell. Only time will tell how it all plays out. But for now, that's all for the moment folks! Time to load up on hydrogen and conclude the Mirai adventure. Keep reading, keep it 'crude' even if - as one said - the next few posts are going to be about hydrogen! © Gaurav Sharma 2018. Photo 1: A Toyota Mirai in Shell signage. 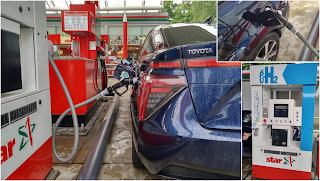 Toyota Mirai being fuelled with hydrogen at a facility in Wolfsburg, Northern Germany, with fuel pump and close-up of car inset. © Gaurav Sharma, May 2018.